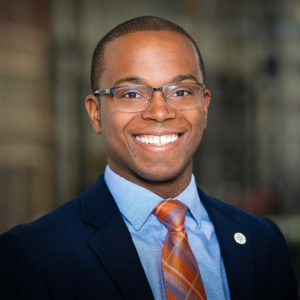 In his role, Terrance provides leadership and support in the development of a state policy agenda with a focus on providing policy flexibility and alignment to support the expansion of personalized learning. His responsibilities include authoring policy documents and white papers to advance educational transformation, leveraging strategic opportunities to provide thought leadership around personalized learning, and working with key partners in targeted states to develop and advance policy recommendations. Prior to his current role, Terrance was the Policy Director of Kentucky Youth Advocates where he worked on general legislation as well as poverty issues. He has also worked for the Kentucky General Assembly/Legislative Research Commission and Louisville Metro Council. Terrance graduated with honors from the University of Louisville with a Bachelor of Science in Political Science and Law and Public Policy. He is also a graduate of the Brandeis School of Law at the University of Louisville where he was Kentucky KLEO Scholar and Thurgood Marshall CLEO Scholar.